Operating frequency 7.69 kHz 6.6 kHz. I was a little shocked my first signal broke the audio about 6" AFTER the coil passed the target!! The ID was right on, however, as was the tonal ID. Pinpointing required a slow sweeping of the target, but after a few minutes, I had the hang of it. I was concerned about multiple targets close together, but in the notch mode I found coins near trash. The weight is comparable to the Compadre, which meant I could-and did-search for hours on end! After frequent testing, I wouldn't hesitate to recommend this as a good starter unit. My "PC tablet on a stick" has features comparable to higher priced machines! If I were to recommend changes, I would have the "zincers" break at high tone instead of being in the tab audio zone---although the visual ID is correct. That way, no looking at the meter to verify. Also, I would have a last mode memory instead of a complete reset. A pinpoint would be nice, but for the price, I can live with it as is. Okay, a long story short. My wife and I went out on a Saturday morning and bought a Christmas tree in a lot, brought it home and put up the tree. After that, I strung lights up on the house, shoveled the walkway and sidewalk, etc. While taking a shower that night I noticed my $800 white/yellow custom made wedding band was gone. Searched with a flashlight for hours, came up empty handed. 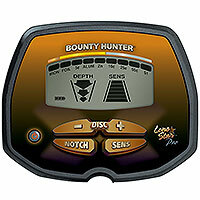 The next morning I went down to Cabela's and bought a Bounty Hunter Tracker IV, headphones, and batteries. Out in the parking lot I put it together, read the manual, and fine tuned the settings using my gold watch on the ground. Went to the Christmas tree lot and after an hour had 12 extra cents in my pocket for my trouble. When I got home, I began searching the lawn, which was covered in 4 inches of fresh snow. I found the ring about an hour later while searching the last spot I had been the day before. The ring had worked it's way through the snow and deep into the grass. Without this detector I NEVER would have found this ring.....even after the snow had melted. In summary, this detector works fine for the price. Some advice, you have to adjust the settings using a known object before you start searching in order to find similar objects. In other words, test it out on a gold ring to maximize the detectors sensitivity and get a feel for the sounds it will make before you go looking around for more gold rings. This is the first detector I have ever used, so nothing to compare it too. In my case, the detector cost about $165 including headphones and batteries (two nine volts), and it recovered my $800 wedding band, a priceless object to me and my Wife. 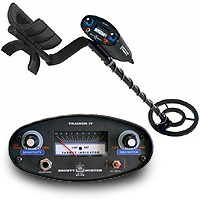 Best part is, I had a great excuse to buy a detector, something I have always wanted!! Another Christmas miracle.